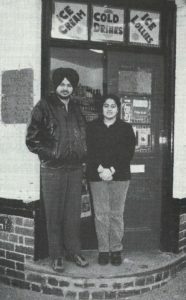 The front page of the Hexpress of February 1999 had a photograph of a young couple Paul and Bindi Dhaliwal standing on the doorstep of their new business here in Hexthorpe. It is 20 years on and they don’t look a year older! They had been married in October of the previous year and by November had bought the shop. The family hailed from South Shields in the north east of England, but Paul and Bindi soon settled here.